My sincere thanks to Anya for finding many of the images and references for this page. She did wonderful research, and should be congratulated. Pendeloque en jais (jet), en forme de corps féminin schématisé. Hauteur : 16 mm. Provenance : Neuchâtel-Monruz (fouilles de l'autoroute N5). Magdalénien (vers 11.000 av. J.-C.). The pendant is in jet, and is 16 mm high. It was found at Neuchâtel in 1991, and is dated at 14 900 BP. The image to the left comes from the brochure of the Laténium Archaeology Park and Museum Hauterive-Neuchâtel on the shores of the lake. When I first saw this piece, I noticed the flat part where the hole is, and wondered if there was something else meant to fit there. 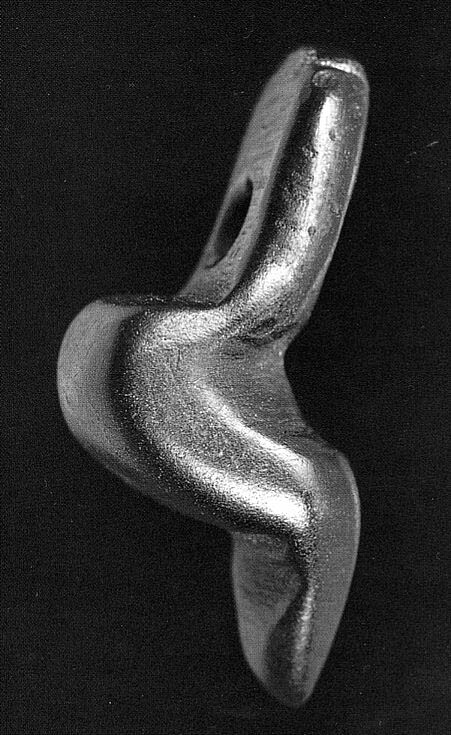 I could easily imagine a doni head carved in ivory (along the same style as the head on the venus of willendorf) fitting in there, held by a wooden toggle at the back of the hole for example. But the hole may be where it is for safety. Jet is essentially hard coal, and is a light and easily worked material, easily cut and polished with, for example, a coarse or fine grained harder rock. By putting a lot of "meat" above the hole, the carver may have been trying to extend its life on the neck without the hole breaking away. The Lady of Monruz. 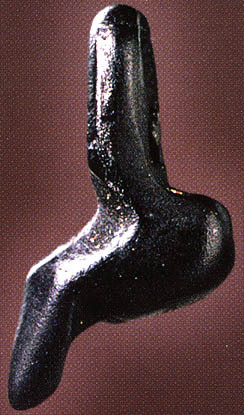 Jet pendant representing a feminine figure, Monruz (Neuchâtel). Magdalenian, ca. 15 000 BP N° inv. NE-MZ 900004. La dame de Monruz. Pendeloque en jais représentant une figure féminine, Monruz (Neuchâtel). Magdalénien, 13000 av. J.-C. env. N° inv. NE-MZ 900004. Photo: Y. André / Laténium. There are three very similar venuses, shown here. They appear to be, left to right, the venuses of Monruz, Neuchatel and Engen. The Petersfels (Engen) venuses are made of jet, or hard coal, and were found at the Petersfels site, near Engen in Germany. 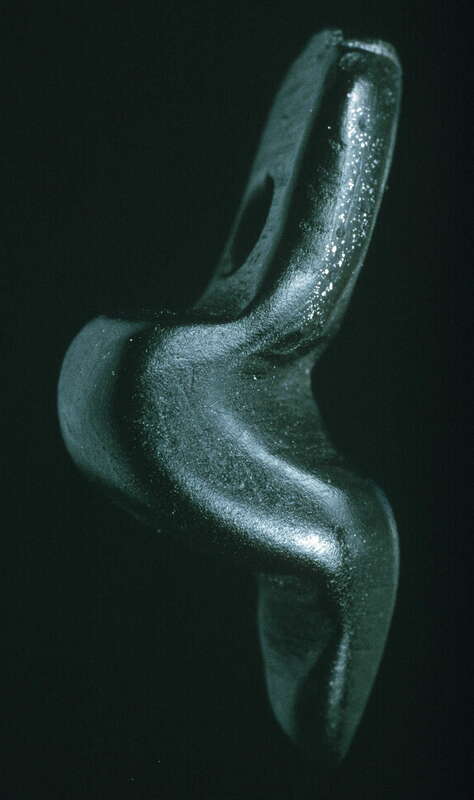 It is one of the most important Palaeolithic sites in Central Europe with an enormous number of important artefacts. It was a settlement site of the Magdalenian (late Upper Paleolithic), with many layers, towards the end of the last ice age, during the period 15 500-14 000 BP. The main activity here was reindeer hunting in autumn. En 1991, des préhistoriens suisses mirent au jour dans un site de plein air d'époque magdalénienne, une Vénus minuscule (18 mm de haut), digne de figurer dans les musés d'art moderne. Station de Monruz (Neuchâtel), Magdalénien supérieur, 13 000: foyer S50 en cours de dégagement. La cuvette comblée de terre cendreuse et charbonneuse contient un bloc de calcaire rubéfié et disloqué par le feu, ainsi que des fragments d'une ou plusieurs plaques de gneiss extraites des dépôts morainiques du voisinage; les éléments de grès visibles au premier plan formaient un bloc-siège de 60 cm de long. Monruz (Neuchâtel), upper Magdalenien, circa 13 000 BP: hearth. The basin contains a block of limestone reddened and cracked by fire, as well as fragments of one or more gneiss plates extracted from the morainic deposits of the vicinity. The sandstone rocks visible in the foreground formed a 60 cm seat. Hauterive-Champréveyres is an open-air site located near the north-eastern end of Lake Neuchâtel at an average altitude of 427 m. An archaeological excavation was necessitated by the construction of a section of the A5 motorway between Neuchâtel and Saint-Blaise. The investigation, conducted by the Cantonal Archaeological Service and financed by the Swiss Confederation, took place between 1984 and 1986. Four Magdalenian and one Azilian occupation horizons were found, interstratified within a sequence of Late-Glacial sediments preserved within three natural depressions (Sectors 1-3) underlain by Würmian ablation till. This publication concerns the principal Magdalenian occupation horizon in Sector 1, and presents a general view of the material and structures uncovered. It also attempts to synthesize the results from the various studies undertaken at the site and integrate them within a global interpretative framework. The detailed analyses of the flint material, the archaeolozoological study, as well as the results from the various palaeoenvironmental investigations, will be published in separate volumes (in preparation). The dating of the occupation horizon is based on a series of AMS radiocarbon measurements on charcoal (Salix sp. retusa type) from the hearths, as well as on various palaeoenvironmental investigations, including pollen, plant macroremains, insects and molluscs. This evidence gives a date of around 13 000 BP. The palynological record places this occupation horizon towards the end of the Oldest Dryas Regional Biozone within the Betula nana Local Pollen Assemblage Zone. 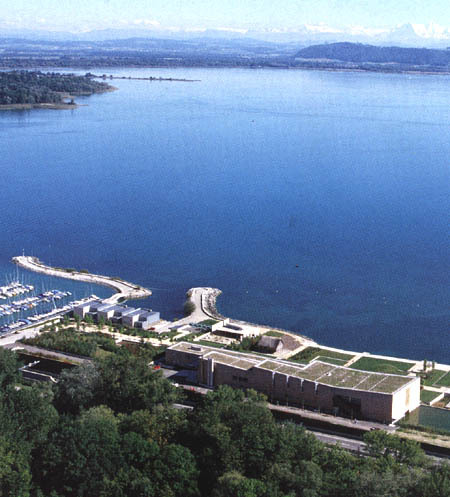 The two images of Neuchâtel Lake above come from the brochure of the Laténium Archaeology Park and Museum Hauterive-Neuchâtel on the shores of the lake. The faunal assemblage is relatively diverse, the majority of species being characteristic of an arctic-alpine or steppe environment; animals typical of forested habitats are absent. Horse (Equus ferus) is clearly predominant, while reindeer (Rangifer tarandus), ibex (Capra ibex), marmot (Marmota marmota), and arctic hare (Lepus timidus) are also well represented. Bones from a few lynx (Felis lynx) and arctic foxes (Alopex lagopus) are also present. Fourteen bird species (mainly linked to aquatic habitats) have also been identified, together with fish remains from four species (mainly Lota lota). Eggshells were also found. Of special interest are several bone fragments which are among the oldest known remains of domesticated wolf (Canis lupus f. familiaris) in Europe. This broad faunal diversity questions the frequently quoted hypothesis that Upper Palaeolithic hunter-gatherer communities had highly specialized hunting practices. The notable frequency of smaller animals like birds and fish compared to other Magdalenian sites, however, may in part be explained by systematic sieving down to a 1 mm mesh size and good preservational conditions. Moreover, the predominance of horse might be due to local ecological conditions rather than a deliberate hunting selection. Sector 1 covers a surface of approximately 200 m2. The finds were three-dimensionally recorded and the sediments were wet sieved by quarter square-metre units. One can distinguish well defined concentrations of flint artefacts and bones associated with eleven hearths. Red ochre is also dispersed over several square-meters in the northern part of the surface. Post-depositional deformation of both the archaeological horizons and their interstratified sedimentary layers has influenced the original position of the objects, but the relative positioning of the finds was only slightly modified and these secondary disturbances have no significant influence on the interpretation of the spatial patterns. The archaeological horizon produced a total of 12 286 flint artefacts weighing 16,4 kg, of which 5532 measure more than 1 cm. Additionally, 16 500 bone fragments with a total weight of 41,4 kg were identified to species or genus level, while another 120 000 (~30 kg) were unidentifiable splinters. Apart from flint, approximately one ton of rock fragments (schist and gneiss stone-slabs and cobbles) was also recovered, most of which had been used for the construction of the hearths. The lithic assemblage includes 591 tools (10 % of the flints larger than 1cm) and 67 cores. Unilaterally retouched backed bladelets form the dominant group (62,6 %), while the other tool categories comprise: burins (15 %, mainly dihedral), endscrapers (8 %), piercers (5,4 %), splintered pieces (2 %), and various other retouched blades and flakes (5,4 %); composite tools are rare (1 %). Furthermore, 246 unmodified blades and flakes used as tools have been identified by microwear analysis. Neither angle-backed nor curved-backed points were recovered. Bone and antler artefacts are rather scarce; they include sewing needles and four fragmented antler projectile points, two of them with double-bevelled bases. The typological and technological characteristics of the industry permit comparisons with a large number of late Magdalenian sites in Switzerland and adjoining regions. There is only limited evidence for decorative elements; this includes four sawn reindeer incisors and some pieces of lignite and amber. Of the latter, one worked fragment is of Baltic origin, while the others are probably of local provenance. The different categories of archaeological material are presented separately and their spatial distributions are discussed. Special attention is paid to the identification and location of the hearths. In this context, flint chips altered by heat have proved to be the most reliable indicator for the location and extension of the hearths (in conjunction with the charcoal concentrations). Other types of thermally altered stone have been shown after refitting to be unreliable indicators since the majority were rejected at their periphery, discarded in refuse areas or reused in different hearths. Eleven charcoal concentrations are clearly identified as flat hearths, while several partially eroded charcoal spreads situated at or near the edge of the depression indicate that the site probably extended beyond the preserved area. Sediments taken from within the hearths have been examined under a binocular microscope; the main component is charcoal from dwarf willow (Salix sp. retusa type), while burnt bone rarely attains high percentages indicating that the systematic use of bone as a fuel is unlikely. In some hearths burnt fish scales have also been found, showing that fish were cooked at the site. The distribution maps for the different categories of archaeological material show spatial distribution patterns similar to those that have been observed at other Magdalenian sites, in particular at Pincevent in the Paris basin. Backed bladelets, burins and burin spalls are concentrated around the edges of the hearths. Waste flakes resulting from core preparation and debitage for bladelets are also largely confined to the immediate surroundings of the hearths, whereas end-scrapers are found further away. Waste debris from bone needle production and the working of antler are also concentrated around the hearths. Estimates for the relative abundance (original numbers of individuals) of the different animal species found within the excavated area are based on the skeletal representations of the identified bones and their spatial distributions. This analysis suggests that approximately 21 horses and 7 reindeer were butchered at the site, together with 16 marmot and 20 hares. The other identified species were present only in small numbers. The spatial distribution of the bones shows that all the hearths were associated with a diverse faunal assemblage, none of them being restricted to only one or two species. Fish remains are also present around all but three of the hearths. In general, remains from the smaller species, such as marmot, hare, birds and fish, are distributed closer to the hearths than those of horse and reindeer. Butchering marks show that the meat was systematically removed from the bones before they were broken open to extract the marrow. The skeletal representation of the various species indicates that the animals were brought to the site whole, probably being only roughly dismembered where they were killed. Possible relationships between the different categories of archaeological material are examined and associations are proposed to define different activity areas; these interpretations are partly based on results from experimental archaeology. Two principal types of activity can be recognised: the processing of animal carcasses, plus the fabrication and maintenance of hunting weapons. Other secondary tasks include sewing and treatment of animal hides, the production of bone needles, antler projectile points, flint tools, and blades for butchering activities. The production of ornamental elements was restricted to a few reindeer incisors and limited working of lignite and amber. In attempting to identify the activity areas, material from the sieving residues often proved to be crucial. Small waste by-products found in these residues, such as retouch flakes, burin spalls, resharpening flakes from end-scrapers, debris from needle production, and fragments of lignite or amber, reveal that most of the tasks took place within activity areas around all of the hearths. An analysis of the stones and slabs in and around the hearths allowed a reconstruction of the initial morphology and functioning of these fire places. Their construction suggests that willow twigs were partially covered with stone slabs and cobbles before lighting the fire. Thus, scarce fuel would be economised, and the heat of the fire considerably prolonged. 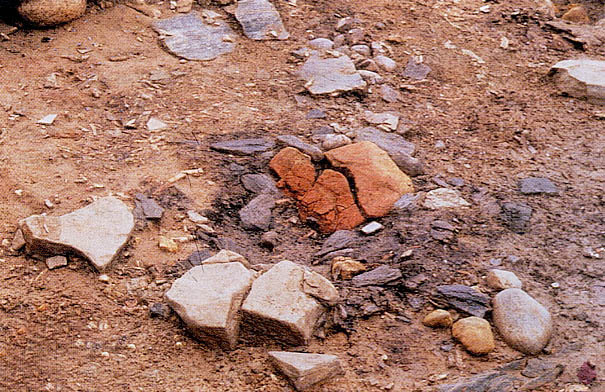 Before the hearth could be reused, the stone cover had to be removed; repeated use of these hearths thus explains the large number and widely-scattered distribution of heated stone fragments at the site. Refitted elements also demonstrate that a certain number of stones were used in more than one hearth. No clear evidence was found proving that stones were used for heating water. The chronological relationships between the different hearths are explored essentially through the refitted stones and flint artefacts. It seems clear that the fire places were not all in use at the same time but in a certain chronological order. Nevertheless, at least four of them were probably used during one stay and by the same group, while all hearths could result from just two or three periods of occupation by a single group. The various faunal elements show that the site was only occupied during the warmer months (presence of birds eggs; marmot – which hibernate during winter – next to nearly all of the hearths). Furthermore, two periods of seasonal occupation can be differentiated: early spring and autumn. The relatively small number of flint artefacts and the distribution patterns of the various categories of archaeological material suggest that these occupations were only short-lived. The presence of habitation structures seems highly improbable. There are a number of indications that the hearths were probably established in the open air, and no convincing evidence could be found for the existence of shelters of any kind. The major arguments against the presence of shelter structures are the type of hearths (flat hearths), the absence of any «wall effect» in the distribution patterns of the finds and the absence of refuse generated by the cleaning-out of tents. The final part discusses the territorial position and the function of the site within the context of an early Late-Glacial environment. It seems probable that Champréveyres represents only part of a much larger campsite. The relationship between Champréveyres and Monruz, a site discovered in 1989 which lies only 1 km to the south-west, remains to be explored. The refitting of blades between these two sites shows that they were contemporaneous. Moreover, the ornamental objects (Tertiary fossil shells, and lignite pendants) discovered at the latter site show clear resemblances to those found at the rock shelter of Petersfels in south-western Germany. Correlating ethnographic information about recent hunter-gatherer settlement- and subsistence-patterns with archaeological data is problematic. The fact that the non-local flint raw material originates from sources located in opposite directions (Bellegarde to the south-west, and Olten to the north-east) suggests various possibilities for interpreting the movements of either this material or the group(s) which used it. The question of short-distance versus long-distance seasonal migrations cannot yet be solved in a satisfactory way. On the whole, however, arguments in favour of restricted movements within a relatively limited territory are the most convincing. Un campement magdalénien au bord du lac de Neuchâtel, étude archéozoologique (secteur 1). 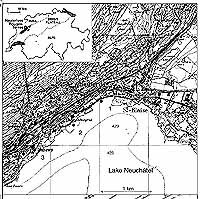 The Late Magdalenian site of Hauterive-Champréveyres is located on the north-western margin of Lake Neuchâtel (western Switzerland) at the foot of the Jura mountains. Some 200 m2 was excavated between 1984 and 1986 in advance of the construction of a section of the A5 motorway between Neuchâtel and Saint-Blaise. This volume concerns the archaeozoological study of the animal bones recovered from the principal Magdalenian occupation horizon, which has been dated by AMS measurements on charcoal and by palynological analyses to c. 13 000 BP (14C years). The vegetation contemporary with the site was typical of arctic-alpine-steppe, dominated by light-demanding herbaceous plants together with dwarf willow (Salix cf. retusa) and dwarf birch (Betula nana). This open-air site lies at 427 m and was originally located near to a part of Lake Neuchâtel which at that time was separated from the rest of the lake by a morainic gravel bar known as the Recif de Marin. A second Late Magdalenian open-air site was subsequently discovered in 1989 during motorway construction, one kilometre to the south-west, at Neuchâtel-Monruz; a refitting between blades from these sites shows them to have been contemporary. These two localities may have formed part of a series of open-air camps along the edge of Lake Neuchâtel at strategic points favourable for hunting. At Champréveyres the absence of habitation structures, the relatively poor lithic assemblage (~5500 flints > 1 cm), the flat hearths which had only been used a few times, as well as the spatial distribution patterns of the archaeological material all seem to indicate either one or a small number of brief occupations primarily associated with the exploitation of game animals. The importance of hunting and butchery for the site is underlined by the predominance of backed bladelets among the flint tools and by the evidence from microwear analyses for blades and other tools having been used for meat and hide processing. Twelve hearths were discovered, which refitting of both the stones employed in the fire-places as well as the flint material has shown to have been contemporary, but used in a certain chronological order and not all at the same time. The bone material (which weighs a total of c. 72 kg) consists of around 16 500 elements listed in the inventory, of which 5000 were recovered during systematic sieving of the excavated sediment by quarter-metre squares. The sieving also produced a further 120 000 unidentifiable fragments. The highly fragmented nature of this bone assemblage is due both to intentional breakage linked to marrow extraction and to post-depositional damage resulting from deformation of the archaeological horizons in the early part of the Bølling. Almost all of the bones have been subject to pre- or post-depositional weathering processes which have caused much of the spongiosa-rich or fragile parts of the osseous material to be poorly conserved, often rendering them unidentifiable. After the highly resistant teeth, the best preserved elements are formed of thick compact bone; porous or fragile elements, such as bones from young animals, are almost entirely absent. It would appear that all the bones which were not embedded in the thin layer of silt (c. 5 cm) that covered the site soon after its abandonment have been destroyed. Thus, of the accumulations of osseous material which were left as a result of butchery activities, only the lowermost bones would have survived. Nevertheless, the richness of the preserved elements, even if they represent only a small fraction of the bones which were originally present, makes Champréveyres an important site for the study of Magdalenian archaeozoological remains. Twenty species have been identified, including ten mammals, five birds and five fish. In addition five species of small mammal, all rodents, have been determined by J. Chaline among the material recovered during sieving. The most important species both in number and size was the wild horse (Equus ferus) with 21 individuals, followed by reindeer (Rangifer tarandus) with 7, ibex (Capra ibex) with 2 and a probable bison (cf. Bison bonasus) with just one juvenile. Carnivores include 3 lynx (Felis lynx), 2 arctic foxes (Alopex lagopus) and a single ermine (Mustela erminea). Other smaller hunted animals included 20 mountain (arctic) hares (Lepus timidus) and 16 marmots (Marmota marmota). Among the bird bones were remains of two black-throated divers (Gavia arctica), a black-necked grebe (Podiceps nigricollis), a whooper swan (Cygnus cygnus – egg shells from this species were also found), a golden eagle (Aquila chrysaetos), a ptarmigan (Lagopus sp. ), four specimens belonging to the duck family, and remains from eight other unidentified birds (both large and small species). Fish were also brought to and consumed at the site; these included 16 burbot (Lota lota), and single specimens of grayling (Thymallus thymallus), roach (Rutilus rutilus), trout (Salmo trutta) and char (Salvelinus alpinus). Several small concentrations of scales from grayling, or a different large cyprinid for which no other osseous material could be identified, were also found. Of great importance was the discovery of one tarsal bone and two teeth which can be attributed to dog (Canis lupus f. familiaris). This is one of the oldest known records for the domestication of the wolf (Canis lupus). A morphometric study of the upper canine showed it to be significantly smaller than those of modern northern wolves; as Upper Palaeolithic wolves were even larger this reinforces the validity of such an identification. Although the difference in size is significant, it is not so great, showing that the process of domestication had been carried out with little intensity or only for a short period of time. Behavioural considerations make it seem unlikely that domestication had at this early stage become focused on specialised types of dog. Consequently, the purposes for which dogs were kept must also have been non-specialised, so it seems highly unlikely that these early dogs were kept and bred as hunting companions. The minimum number of individuals (MNI) for each species has been estimated using the total number of identified bones, the accumulated weight of certain types of bone fragments (for the horses only) and the minimum number of each skeletal element. For the horse and reindeer the MNI was largely based on the teeth, which required the reconstitution of teeth series. For the horses such series principally use the cheek teeth (molars and premolars) and take into account the age of the individuals, the pattern of the enamel revealed in the wear surfaces, the nature of the approximal contact between the teeth and any anomalies or notable characteristics observable in the growth lines of the tooth crowns or in the formation of the cementum. This method has produced a MNI for the horses which is considerably higher than the figures based solely on the count of unique elements, either among the teeth or from the post-cranial skeleton; this significant difference is due largely to the fact that many of the horses were juveniles whose bones have almost entirely disappeared. The MNI values for the other species are based on the classic method of counting the best represented skeletal elements, in addition to the spatial distribution of the faunal remains assuming that the bones from each of the smaller butchered animals were restricted to a relatively small area which was linked to a single hearth. It appears that both horse and reindeer carcasses were carried to the site either complete or only partially dismembered. There is no evidence either for parts of butchered animals being brought in or for portions of the carcasses being removed and taken elsewhere. The same observations hold true for all the other species except the mountain hares, whose foot bones were largely missing, and the marmots, whose skull elements were significantly underrepresented. The spatial variation of the different species across the habitation surface varies with their size. In general, the smaller animals are more closely associated with the hearths and less dispersed than the larger ones. After dismemberment the bones from the horses were scattered over a significant area; the teeth series, for example, were often dispersed over several square metres. While the horse bones were not linked to individual hearths, the reconstitution of the teeth series shows that there were three distinct bone scatters. These could correspond to three separate visits during which several horses and various smaller animals were butchered and only some of the hearths were in use. A fourth stay may have seen the butchering of an ibex as well as several smaller animals, but no horses. All of the possible stages associated with carcass preparation and butchering could be studied, at least partially, for the site of Hauterive-Champréveyres, from skinning and dismemberment through to the breaking open of the bones for marrow extraction. Butchery marks caused by flint implements were well represented, though infrequent, for all species, almost all of them due to the stripping of meat from the bones. No marks can be attributed to the removal of hides or skins, and only a small number are caused by the disarticulation of the bones. The virtual absence of the latter type must be due to the butchery techniques employed, as well as to the quality of the flints utilised, as it is certain that the bones were disarticulated prior to marrow extraction. The majority of the butchery marks confirm, however, that the stripping of meat from the bones was very thorough for both large and small animals alike. After meat stripping the major limb bones, especially for the larger mammals, were systematically broken open for marrow extraction, while the articulations were fractured to exploit the fat. The relatively large number of big game animals brought to the site (horses, reindeer and ibex as well as the young bovid) would have provided several tons of meat in addition to fat and viscera. Such a quantity of food could have fed several families during a number of weeks, but this appears to be in contradiction to the other archaeological data from the site which all seems to suggest several rather brief visits. It would seem likely, therefore, that Hauterive-Champréveyres was a camp for butchering game and other animals killed nearby (hence the entire skeletons). The parts that would decay quickly, such as the viscera, were probably consumed immediately on site, while the red meat would have been cut up and dried, and the marrow and fat stored. The most lengthy operations that would have required at least two to three days, such as drying the meat and preparing the hides and skins, would probably have determined the length of stay at the site. Thus other activities like hunting for small game, the fabrication or repair of hunting weapons and other tools, in both stone and bone (projectile points and needles), as well as the working of lignite and amber for ornamental purposes, could all have taken place during this period of waiting. If true, then the exploitation of small game would have played only a secondary role compared to the hunting of larger mammals, though the fur from lynx, arctic foxes, marmots and hares would certainly have conditioned the choice of hunted animals. Birds would have provided feathers, meat and small bones suitable for needle production. The great diversity of species gives an impression of opportunistic faunal exploitation, but it seems conceivable that all activities documented at the site (both palaeoeconomic and domestic) were organised around the hunting of horses. The seasons when the site was occupied were determined using both the biological cycles of the animals present at the site (growth rings in the cementum of the horse teeth and in the fish bones, growth stage and shedding of reindeer antlers, egg shells, and the presence of animals which are only available during certain seasons of the year, such as fish and aquatic birds which would have been inaccessible or absent in winter when the lake was frozen over, as well as marmots which hibernate), and the age to the nearest month when juvenile animals such as horses were killed (based on tooth eruption and wear, plus bone fusion data). The female reindeer antlers seem to have been on the point of being shed, suggesting a date in spring in agreement with the presence of swans' eggs. The fish bones have unfortunately produced no clear data due to both the complicated ecology of burbot, the principal species, and the poor state of preservation for the other species. The juvenile horses and reindeer seem to have been killed in both spring and autumn; the growth lines in the tooth cementum have given no clear results, but do not contradict the above conclusions. The presence of fish, aquatic birds and marmot, together with the other archaeozoological evidence, rules out any occupation during winter. The reconstruction of the vegetation on the basis of the ecological requirements of the mammals and birds suggests a completely open, mostly low-growing plant cover. Such a habitat is often said to be tundra-like. No modern vegetational analogues exist, however, which can replicate the plant communities adapted to the abiotic growth conditions of the Swiss Plateau around 13000 BP, so such comparisons should only serve to give an idea of the type of environment. Some animal species need a richly structured habitat with a high floral diversity, while others are adapted to food of low nutritional quality. The small mammals, all rodents, reinforce this ecological picture as the collared lemming (Discrotonyx torquatus) is normally associated with damp or marshy ground and a cold climate, the root vole (Microtus oeconomus) also likes damp or marshy environments, the common vole (Microtus arvalis) prefers a moderately rich but not tall herbaceous cover, but the snow vole (Chionmys nivalis) inhabits rather rocky or stony habitats which are often poor in vegetation. Small-game exploitation in Upper Palaeolithic context – only for the taste of it? The exploitation of small game is frequently assumed to have gained a widespread significance only towards the end of the Paleolithic. This is then attributed to human population growth pulses, which demanded for intensified and thus broadened exploitation of the available animal resources, hence including swift and difficult-to-catch small game. Yet both, the contemporaneousness and the causal link between human population growth pulses and exploitation of agile small game have been disputed. While the contemporaneousness is easier to disprove than to prove, it depends on large and reliable data sets, and will not be treated here. The causal link, and thereby the motivation for hunting agile small game, will be addressed, using two Magdalénien sites from Switzerland as examples (Hauterive-Champréveyres and Neuchâtel-Monruz). In these two sites the wild horse dominates heavily in terms of NISP and weight of fragments. The preponderance of the horse is equally apparent when the acquired biomass (MNI multiplied by average weight) for each species is considered. On the contrary, when comparing the number of hunted individuals of the different species, it becomes clear that the horse accounts for less than one third of the total number. It might seem far-fetched to compare a hunted horse with a hunted hare or passerine bird, yet for our line of argument it is instrumental to realize that each hunted individual represents one successful hunting event. It is obvious, however, that the spent energy (input) as well as the acquired raw material (output) of a hunting event differ markedly from species to species. And it is equally clear that it is the sum of input and output that has to be positive, i.e., to make hunting a certain species profitable. Consequently should a shift in the exploitation of a species be indicative of a shift in the profitability of its acquisition. The answer to the ensuing question, of how the profitability of a species can change, has to be sought either on the input or the output side. The input could be positively changed by a new weapon or hunting method allowing a more energy-efficient hunt. The proponents of the above mentioned broad-spectrum-revolution hypothesis argue that the motivation for hunting small game derived from the pressure of increased human population. This implies that, either, they had the means to exploit a certain species, but opted not to do so but under pressure, or, they developed the means to exploit this resource of swift small game only when coming under pressure. It is difficult in this scenario to discern cause and effect. On the other side could the output have changed in the way that the value of certain raw materials (e.g., feather, bone, etc.) was judged differently. This point reiterates that it is not only the amount of the raw material but also its quality, which leads us back to our example: At the site of Monruz approximately 45 horses were hunted. With only one additional horse, the equivalent amount (weight) of raw material (meat, skin, bones, intestines, tendons, etc.) of 100 hares could have been acquired. It seems implausible that they should have stopped short of hunting a 46th horse because this resource was exhausted and that they were then forced to exploit small game. Although difficult to estimate it seems reasonable to assume that the input of hunting 100 hares exceeds by far that of hunting one horse. The more plausible conclusion is, therefore, that the quality of the raw material is one of the crucial factors for hunting small game. A very small but important object was located on July 26, 1990 in a sieve where, under the controlled action of a jet of water, the sediments of the prehistoric layer of Monruz revealed the bone, flint pieces, molluscs, and small pieces of charcoal to be identified on the excavation site. The site of Monruz (commune of Neuchâtel) borders the lake over a length of a hundred metres. Formerly open to the air, it was by now covered with five metres of clay, sand, and gravel , capped by the bitumen of a trunk road. There was found a campsite of hunters from 12 to 13 thousand years ago in which were found hearths, powdered surfaces of red ochre, flint tools and scraps, food wastes consisting primarily of bones of horses but also, in smaller proportions, those of marmots, reindeer, various hares and fish. But a small object of a little more than one centimetre appeared in the sieve which was black, firm, smooth, and of sinuous profile. Several indications showed that it was produced by humans rather than from natural causes. No bone, indeed, no seed takes this form. At one end, the remainder of a hole clearly shows the action of a drill. It was made of jet, a variety of carbon or coal. At first it was classified as perhaps a small seal! But a female prehistorian recognised it for what it was, and exclaimed that it was a Venus, to the astonishment of the discoverers. For at least 30 000 years, man has carved female statuettes, initially realistic enough, then increasingly diagrammatic. The "lady of Monruz" is located at the end result of a long sequence, a little before the end of the last ice age. One understands this form only if one refers to the series of Venus figures made out of stone, bone, mammoth ivory, and ceramic known from France to the Ukraine. 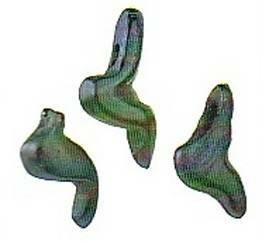 A dozen (all small) pendants made out of jet were also discovered in the rock shelter of Petersfels (Bade-Wurtemberg), extremely similar to that of Neuchâtel but presenting some differences. « Détective du passé » est une expression imagée que l'on utilise parfois pour désigner l'archéologue. L'analogie entre certains types de raisonnements pratiqués tant en police judiciaire que sur un chantier de fouille se trouve soulignée de la sorte. Face aux crimes à élucider ou aux documents antiques à interpréter, on s'appuie, en effet, sur des indices, des traces. Dans les deux cas, l'échafaudage des conclusions repose sur un socle trop souvent teinté de doute. L'erreur archéologique, à vrai dire, semble de prime abord moins dommageable que celle qui fait de l'honnê te citoyen un gibier de potence. Pourtant, il est arrivé que des conclusions historiques naïvement ou délibérément fausses aient entraîné des nations dans la guerre. Pour seul exemple (il en est plus qu'on n'imagine), rappelons les arguties spécieuses de certains archéologues ou anthropologistes à la solde du pouvoir nazi. Face à de tels errements, on comprend que certains esprits bien faits soient saisis de doute, voire de scepticisme. Vrai ou faux ? telle est la question. « Je ne crois plus aux lacustres ! » nous disait un vénérable vieillard ébranlé dans ses convictions patriotiques par la modification d'une image familière ayant figuré dans ses manuels scolaires. J'eus beau lui expliquer que ce n'était pas une telle appellation qui devait ê tre changée, mais bien l'image de l'environnement immédiat des villages, et que nombre d'habitants de notre pays sont aujourd'hui des lacustres dans la mesure où ils vivent au bord d'un lac et pas forcément dans des marinas pieds dans l'eau : rien n'y fit. A l'acceptation d'une modification normale du savoir, qui évolue en fonction des données à disposition et des techniques d'interprétation, mon interlocuteur préférait le mépris face à la discipline qui l'avait déçu. Le droit à l'erreur est donc l'une des faveurs que l'archéologue sollicite de la part des visiteurs de ses chantiers ou de ses expositions, des lecteurs de ses oeuvres, des auditeurs de ses conférences, des spectateurs de ses films. Les vertus du « sans doute » pallient le flou d'interprétations difficiles, d'hypothèses mouvantes - sans que les conclusions ne soient totalement remises en question à chaque découverte car, mê me s'il subsiste une zone d'incertitude, le noyau ferme des résultats absolument sûrs s'accroî t.
Afin d'illustrer ce processus, penchons-nous sur un tout petit objet important qui fut repéré le 26 juillet 1990 dans un tamis où, sous l'action contrôlée d'un jet d'eau, les sédiments du gisement préhistorique de Monruz révélaient les esquilles d'os, éclats de silex, mollusques, charbons de bois trop petits pour avoir été identifiés sur le chantier de fouille. Le site de Monruz (commune de Neuchâtel) borde le lac sur une longueur d'une centaine de mètres. Autrefois à l'air libre, il fut recouvert par cinq mètres d'argile, sable, gravier chapeautés par le macadam d'une route à grand trafic. Il s'agit d'un campement de chasseurs d'il y a 12 à 13 millénaires qui abandonnèrent sur le rivage foyers, surfaces saupoudrées d'ocre rouge, outils de silex et déchets de fabrication, reliefs alimentaires consistant essentiellement en ossements de chevaux mais aussi, en proportions moindres, de marmottes, rennes, lièvres variables, poissons. La « petite chose » d'un peu plus d'un centimètre apparue dans le tamis était noire, ferme, lisse, de profil sinueux. Plusieurs indices permettaient, d'emblée, de la ranger dans la catégorie des productions humaines plutôt que naturelles. Aucun os, en effet, aucune graine n'a cette forme. A une extrémité, le reste d'un trou montre nettement l'action du perçage au moyen d'un foret ; quant au matériau, déterminé par la suite, il s'agit du jais, variété de charbon absente de la région. Gardons de cette étape une leçon essentielle : placé face à l'insolite, l'homme juge d'après les références que lui ont conférées son éducation et ses expériences personnelles. Un pas supplémentaire fut franchi peu après, lorsqu'une préhistorienne vint à passer par là. « C'est une Vénus ! » s'exclama-t-elle, au grand étonnement des « inventeurs ». Baptiser d'un nom de divinité une micro sculpture incroyablement schématique et, de surcroî t, six fois plus ancienne que l'antiquité romaine relève de cette hardiesse peu commune que d'aucuns appellent génie. Le diagnostic était juste, ainsi que divers critères permirent de le contrôler, quand bien mê me l'appellation de « Vénus » pour désigner une figure féminine de l'âge de la pierre taillée s'avère fallacieuse : rien à voir avec la déesse de la beauté... Mais les préhistoriens admettent ce concept à la fois humoristique et suranné, inventé au XIXe siècle. Entre connaisseurs, on sait ce que désigne le terme en question, simple convention largement acceptée. Le passage du phoque à l'humain relevait moins de l'identification de signes anthropologiques indubitables (à part l'ampleur de l'arrière-train et le pli du genou, ils sont singulièrement discrets) que de la connaissance de nombreux éléments comparatifs au travers des millénaires. Depuis 30.000 ans au moins, l'homme sculpte des statuettes féminines, d'abord assez « réalistes », puis de plus en plus schématiques. La « dame de Monruz » se situe à l'ultime aboutissement d'une longue séquence, peu avant le réchauffement climatique inaugurant les temps modernes. On ne comprend sa forme que si l'on se réfère à : la série des « Vénus » en pierre, os, ivoire de mammouth, argile connues de la France à l'Ukraine ; une douzaine de toutes petites pendeloques en jais découvertes dans l'abri sous-roche de Petersfels (Bade-Wurtemberg), extrê mement semblables à celle de Neuchâtel mais présentant quelques variantes. Au stade de la « simple identification », mais pas encore à celui de sa signification, divers « déclics positifs » sont d'ores et déjà survenus : constat d'une « anomalie » parmi le « bruit de fond » émanant du banal contenu d'un tamis ; sauvetage de « la chose » (qui, en fait, courait le risque d'ê tre éliminée car « jamais vue ») ; rejet de l'hypothèse « curiosité naturelle » et rattachement aux productions humaines ; première définition (en l'occurrence, inexacte) de l'artefact ; intégration justifiée à une série connue, celle des « Vénus paléolithiques ». Chaque étape comporte le péril de la bifurcation vers une voie erronée. A combien plus forte raison la suite de la démarche présume-t-elle ce risque ! car connaî tre le sens réel de la petite pendeloque au sein de la civilisation d'où elle provient relève d'un chassé-croisé entre suppositions plus ou moins subtiles, comparatisme ethnographique, croyance aux archétypes. Le fait que la figurine provienne du voisinage d'un foyer n'aide en rien à sa compréhension, contrairement à d'autres cas où la situation topographique précise d'une trouvaille s'avère absolument essentielle. Un tissu de spéculations précède un constat assez banal : une pendeloque en forme de statuette féminine a été perdue (ou déposée) à l'emplacement d'un campement de chasseurs datant de la fin de l'âge du Renne ; elle est semblable à d'autres parures découvertes dans le sud de l'Allemagne ; il est probable que sa signification ait été non seulement décorative, mais magique ou religieuse ; l'amplification du bassin paraî t relever d'une préoccupation concernant la fécondité. De telles conclusions sont à la fois pauvres et riches. Pauvres, dans la mesure où elles n'autorisent pas le face-à-face avec le porteur du bijou, encre moins avec son créateur ; riches, car elles ajoutent aux silex, ossements et foyers le charme de l'art et ses mystères, ainsi qu'un rapprochement entre deux sites préhistoriques séparés de 180 km. Au carrefour des rares certitudes convergent les allées conduisant à la connaissance des territoires parcourus, des échanges à longue distance, de l'interaction entre l'homme et la nature, de la quê te des matériaux rares, des techniques de fabrication, des traditions, du souci de la pérennité humaine, de l'esthétique, du rôle accordé à la femme. Aux interrogations essentielles de l'archéologue entouré de spécialistes (« Quoi ? Où ? Pourquoi ?) s'ajoutent des questions aux réponses souvent incertaines : « Comment ? Pourquoi ? » Il n'est pas interdit de penser qu'elles conduiront bientôt, elles aussi, à des solutions acceptables. Müller-Beck, H. and Albrecht, G. (Ed. ), 1987: Die Anfänge der Kunst vor 30000 Jahren Theiss: Stuttgart.